What Conveyor Belts do I need ? How do you know what Conveyor Belt you need? Providing all the informative information you need on selecting the correct conveyor belting solutions for your individual applications. Brikade Ltd can help you with a turnkey system with impartial advice for all your production process our aim is to dramatically improve your cost effectiveness. Years of experience in conveyor design and manufacturer across a wide spectrum on industries give us the knowledge needed to access which conveyor will best suit your production needs. Heavy Duty Belts can be provided for the more industrial type of application. Chevron belts and Trough Belts are typical solutions. Having a reliable conveyor system in place that will be able to cope with the general abuse and overload that often happens with type of equipment is imperative. 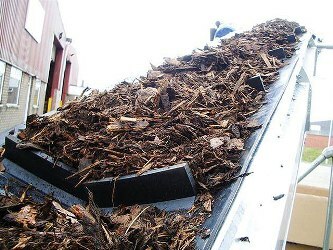 If your belt conveyor fails you will loose production in downtime which ultimately looses you money. So you can see how important it is to find the right type of belt and conveyor equipment for your plant. Belt Conveyors can enhance your productivity but to get the benefit of this you need to have your conveyor specifications set out correctly to get the ultimate benefit. What we advice is a site visit where you can sit down with one of our experienced engineers to discuss your product handling only too often we are asked for a standard stock conveyor unfortunate one conveyor to fit all industries and products just does not work. It is important to identify what you require of the conveyor and the budget you have and come up with the solution custom built for your individual products. One of the advantages of Conveyor Belts over say rollers is that products that have irregular shapes will not fall through. when using Conveyor Belt there is nowhere for it to fall. Guide rails can be added to the sides of belting to stop products falling of the sides. 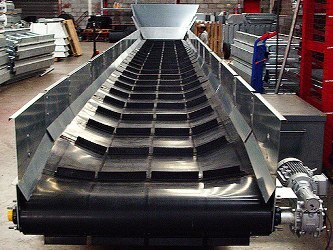 Types of Belt Conveyors can be fabricated in Stainless Steel, Mild Steel or Aluminium. Aluminium Conveyors are the cheapest style of conveyor and can be used in many applications they can be purchase fully assembled or you can find companies that offer aluminium conveyor in kit form. These are the most commonly and traditional type of conveyor in most industries and will serve you well if maintained. It is still widely used as it can be very cost effective ideal for packing and picking lines. Often used in packaging, food, printing, paper, packaging, industries manufacturer in polyester fabric making it flexible strong and tear resistant. Rubber belts use in industries such construction, mining and aviation as well as chemical applications.